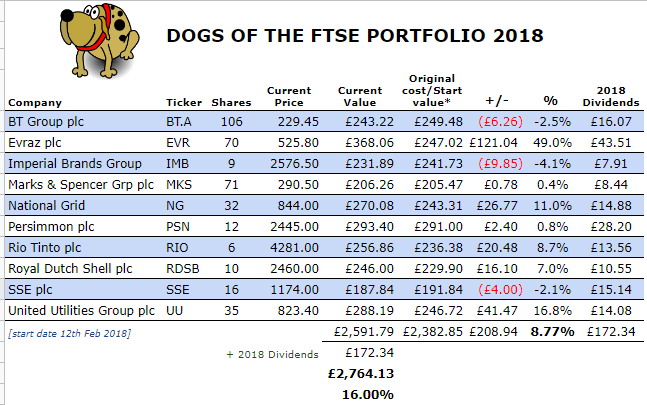 Just a quick update to say that I’ve reached the twelve-month mark for my 2nd experimental Dogs of the FTSE portfolio. So how did the mutts perform with the markets going all pear-shaped towards the back-end of last year? A very decent 8.77% gain, but if you include dividends, this becomes a mighty 16% gain for the entire portfolio! Nice! Ok, so most of the gains were from just one stock (Evraz) but with some other gains (eg National Grid and United Utilities), the small losses made little impact on the portfolio. I do intend to run a 2019 portfolio, or rather a 2019/20 portfolio but there will be a slight delay, because I’m going to wait til next tax year as I plan to use a different ISA account for this experiment. So for now, I will just hang onto all the Dogs for a while longer and sell/buy when I am able to. The Dogs will return in April! 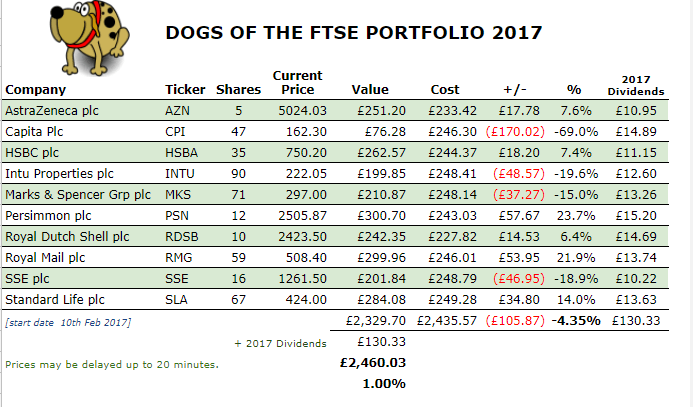 Just my luck that as I reach the twelve month mark for my experimental Dogs of the FTSE portfolio, things go all pear-shaped in the markets! Whilst I have largely avoided reading all about the hysteria, it was difficult to ignore the headlines describing the small downturn with words such as ‘TURMOIL’, ‘BLOODBATH’ and ‘CARNAGE’! I didn’t worry about my Future Fund – I’ve no idea how much it’s dropped by as I’ll be running my usual numbers at the end of the month, but I did think about how it was going to affect my little Dogs portfolio. Capita (CPI) in particular suffered in a spectacular fashion – I know it hasn’t been in the FTSE 100 for a while but they were one of the top yield stocks when I started the portfolio so I was committed to purchase and hold them for the year. Oh dear, indeed! Not pretty – Capita wiped out my total gains all by itself, yet back in July, it was showing a 25% gain, not including dividend paid. Gosh, I probably doomed the stock by saying that it was ‘showing its pedigree’ in that post – little did I know how the mighty would fall! 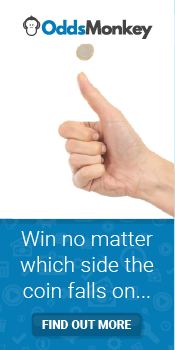 So, including dividends, only a paltry 1% gain for the entire portfolio! OUCH! 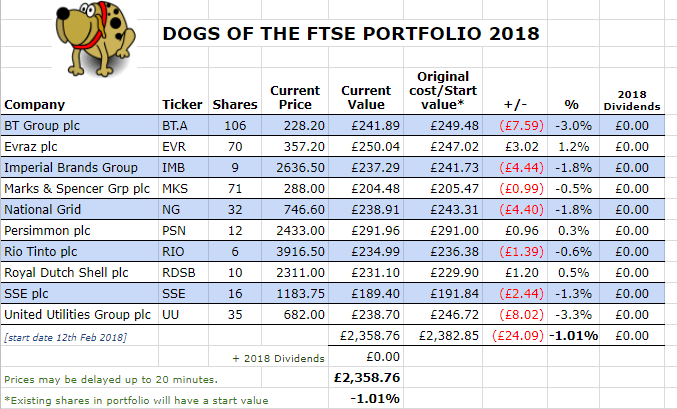 However, over this same period, the FTSE 100 Total Return was only 0.81% so despite the Dogs being a disappointing let down, they marginally did better, haha! Without dividends though, they seriously under-performed with a 4.35% loss. What’s next is the 2018 portfolio! Oh yes, I’m going to put myself through this again in the name of err, ‘financial science’ and hope there won’t be Turmoil, Carnage or Bloodbaths this time round, nor any spectacular Capita-style demises! Profit/Loss from original investment = -£92.45 or -6.3% – ouch! It was not easy at all pushing the ‘sell’ button for some of those but I am committed to the strategy. Wrong time to sell, right time to buy? Who knows!? I’m not timing the market. Best of breed or mangy mutts? Hmmm…for some reason I don’t feel quite as confident as I did this time last year, but we shall see in 12 months time and as before, I’ll be doing quarterly updates. I’m not sure I’ve learned anything from running this experiment after just one year, though I must say that I thought the portfolio was going to do better. I guess if I hadn’t been following the strategy, I’m not sure I would have sold some of those stocks. Let’s see how it goes after a few more experiments. The boss announced the other day that he’d just started converting his garage into a ‘cinema room’, splashing out on a high-end projector, getting the whole garage sound-proofed. Once done, I’m sure he’ll be buying an expensive sofa in there so he can watch movies comfortably. This is despite the fact that he has no less than three television sets in his house (including a 55′ and a 3D set). A few other colleagues joined in on the conversation and I realised that I was the only person there who has just the one television set in their house – in my living room. I don’t need one anywhere else! However, what I do have is a radio in my kitchen, bedroom and bathroom. I often listen to the radio on my pc while I’m surfing the net/blogging. Oh, and of course, there’s the radio in my car. It’s funny how in this age of technology that the humble radio is still so popular after its invention over a 100 years ago. Of course, it’s radio’s versatility that has maintained its popularity – you can listen via digital (DAB) technology, online (streaming or podcasts) as well as via good old normal radio waves (FM/AM). Plus of course, listening to the radio costs you nothing (although it may cost if you listen on your mobile). My radio listening consists of a mixture of music, sport and news. However, this past year, I’ve been listening more and more to Share Radio, which is a UK radio station dedicated to financial related stuff. The station broadcasts on Greater London DAB and broadband internet (which is how I listen to it). On my tablet, I listen to it via the TuneIn radio app (the basic free one works well for me). There’s pretty much something for everyone, including shows aimed at young people/students and others targeted at women. Plenty more for investors (both experienced and non-experienced) or people just interested in finance or interested in learning more about finance. Sometimes, I just listen to whatever is being broadcast live but mostly, I dip in and out of the podcasts, of which there are many. Recently, I’ve caught some of the ‘Managing My Money’ series, which is in conjunction with the Open University – an audio course of sorts where you can answer a quiz after listening and get an OU course completion certificate. The series I think is aimed at 20-30 somethings, it’s presented in a non-serious way (with music and comedy sketches) – quite a different and amusing way of ‘teaching’ about finance stuff. Recent podcasts I’ve listened to have been about the trend of robo-advice and the impact of robots/automation on jobs. Other podcasts I’ve listened to have been about crowdfunding, investment trusts and some case studies for small businesses. Anyway, I think it’s worth checking out Share Radio as there could be something there you find interesting. There are the occasional adverts but they’re not half as annoying as the ones that you usually get on commercial radio. 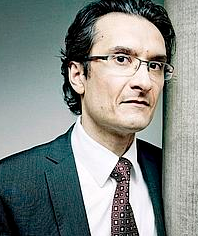 Arturo Bris is a Professor of Finance who teaches Advanced Strategic Management and Strategic Finance at IMD, a top ranked Swiss business school. Previously, he taught at Yale. So you could say that he might know what he’s talking about when he predicts that the next global financial crisis will hit in April 2015 – only a mere 9 months away – and that the crisis will last for a whole year! So what’s an Investor to do? As someone who wasn’t an investor back in 2008, I have no idea how I will react to prices tumbling and all hell breaking loose. I would hope that I stay calm, develop nerves of steel and be able to sit tight…though I’ll probably sweat a little lot! So, my strategy (if you can call it that) is to continue doing what I’m doing now, ie monthly investing into a mixture of equity funds, bond funds and putting aside some cash. Hopefully I shall see any crash as ‘opportunity’, though this will probably be easier said than done! So…9 months to go…. I’m betting there’ll be no baby shower for this ‘Apocalypse Baby‘! Saving and investing so early retirement is an option. Balancing life enjoyment 'now' with investing for 'later'. Read about how I started my journey HERE . weenie on Want to Twin Your Toilet? Dr FIRE on Want to Twin Your Toilet? tony on Want to Twin Your Toilet? Bored Yet, after 5 Years? Weenie has read 0 books toward her goal of 30 books.